In the free market nowadays, allocating the scarce of resource and allow the market to forces supply and demand to set prices is the very view of the government. Therefore, protect property right, maintain the value of the currency had become the role of the government. Improvements in allocative, dynamic efficiency and productive are often deliver by the competitive markets. The erosions for policy intervention are mainly to correct for market failure, attain a more equitable distribution of income and wealth to enhance the achievement of the economy. There are many methods the intervention can take place. For example are the laws on minimum age for buying cigarettes and alcohol. The government appointed utility regulators who may levied taxation on certain goods. Per-unit tax can be defined as a fixed amount for each unit of good and service sold. Per-unit taxes are often imposed on specific goods, services or markets such as non-alcoholic beverages, gasoline, alcohol and cigarettes for particular reasons. An ordinary reason is to advocate the allocation effect. This means that the government discourage the production, consumption or exchange of the specific merchandise. Non-alcoholic beverages, gasoline, alcohol and cigarettes are also known as excise tax. Excise tax can be deliberate as an indirect form of taxation. This is because the government indirectly apply the tax to the consumer. This tax is normally passed on the consumer as the normal cost of doing business. For example, if a bottle of wine costs $10. It may have a specific excise tax imposed onto it which is $2. This additional cost of the wine would be levied onto the consumer, making the market price to be at $12 for per bottle of wine. Government imposed a tax onto it is because alcohol is bad for our health. Therefore, a tax levied onto it may reduce the consumption of some consumer. Taxes are kind of a significant sources of revenue for government. On the other hand, taxes would decrease the supply curve and demand curve in the market because sellers obtain less revenue for their product and buyers would need to pay a higher price for the goods they want. Occasionally, government will try to reduce the burden of the tax for sellers and buyers due to a high exes for sellers or buyers if the government set the tax for only one of them. For example, the federal government does with the payroll tax. The government require both of the labors and firms to pay half of the taxes. The rationale behind why governments would want to impose a per-unit tax on buyer or seller of certain goods. Firstly, let’s say about excise taxation. Excise is a taxation which is enforced to a narrow base of goods and services which are seen to have harm associated with their expenditure, such as tobacco, alcohol, fuel, motor vehicles, and in some other countries to wider the range of products. For example soft drinks, coffee and tea. Government use such goods taxes to achieve multiple objectives. And also excise tax are used by government to generate revenues. For the most common example, tobacco, government impose three types of tax on tobacco. One of the types is excise tax. While government enforce a wide diversity of taxes on tobacco products, it is the unique taxes to tobacco products called tobacco excise taxes that straight away effects the comparative prices of tobacco products. Therefore, it has an extreme control on tobacco use. As evidence, governments using a higher tobacco taxes as a means to discourage its use after it has assembled about the health and economic consequences. Historically the elementary objective of tobacco taxes has been revenue generation. Furthermore, non-alcoholic beverage is also one of the common example for governments would want to impose taxes on this goods such as sugar-sweetened beverage (SSB). The rate of the sugar-sweetened beverage among adults and children are constantly increasing in United States. Take more sugar-sweetened beverage could cause heart disease, diabetes, obesity and also dental decay. To raise the obesity prevention and to reduce the ingestion of sugar-sweetened beverage in United States, the American Public Health Association should have to support the government and federal in impose an excise tax on sugar-sweetened beverage and it would raise the price of all the sugar-sweetened beverage in the States. After a research, it shown that sugar-sweetened beverage are price elastic. It is probable that if government raise the beverage price by 10% would decrease the intake of sugar-sweetened beverage by 10% as well. However, reduce in intaking of sugar-sweetened beverage, tobacco, alcohol and others unhealthy products is likely only if the consumer aware of the prices increases before they pay. So government are preferred able to impose excise tax than a sales tax. An excise tax are impose on the beverage manufacturing which will straight away pass the cost to customers so that they would aware of the price increases. Excise taxes is a kind of taxes on particular products only. This elastic demand pushed the tax burden on the sellers instead of buyers. Nevertheless, there are some goods which demand is inelastic because there are no good that is close substitutes, such as alcohol and tobacco. In conclusion of excise tax, the tax burden for his few goods falls more on the buyers than the sellers. Elasticity is a measure of responsiveness of quantity demanded or quantity supplied to a change in one of its determinants. Price elasticity of Demand is a measure of responsiveness of quantity demanded towards changes in price. Many products are subject to taxes. For example, goods such as tobacco, alcohol, and fuel. Here we see the consequences of indirect taxes on costs and the significant of price elasticity of demand in that determines the effects of a tax on price and quantity. – In the diagram on the left, the demand curve shows that the price is elastic. This makes the producer bear more of the tax burden. When the demand is elastic, the effect of tax is to raise the price however there will be a big reduction in equilibrium quantity. The quantity decreases from Q1 to Q2 as shown in the diagram in the left. 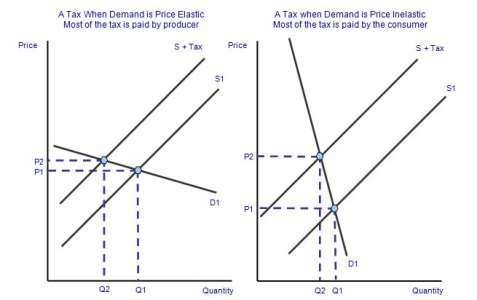 – In the diagram on the right, the demand curve shows that the price is inelastic. Price elastic demand is more than one in most parts of the demand curve. The producer is then able to pass on most of the tax to the consumer by increasing the price without losing too much sales because when a good is inelastic, the consumer still has to buy although the price increases. This is shown in the diagram on the right when price increases by a lot, the quantity demanded only decreases by a little. Price elasticity of Demand, in combination with Price elasticity of Supply, can be used to find the incidence or burden of a per-unit tax is falling or to foresee where it will fall if the tax is levied. For example, when demand is perfectly inelastic, that means that consumers need the good and that the good is a necessity, so the quantity demanded remains consistent. Suppliers usually will increase the price by the full amount of the tax, and then the consumer will bare the full amount of tax. But when demand is perfectly elastic, that means there are other substitutes for the consumer or they can buy it cheaper somewhere else, this causes consumers to stop buying the good or service in question completely. Therefore, firms cannot pass the tax at all by raising prices, so they will have to pay for the tax themselves. In conclusion, many products are subject to taxes. With an indirect tax, the supplier can shift the burden of the tax to the consumer by increasing the price of the good. When the price is elastic the producer will bear more of the tax burden. When the price is inelastic. Price elastic demand is more than one in most parts of the demand curve. The producer can pass on most of the tax to the consumer by increasing the price without losing too much sales because when a good is inelastic, the consumer still has to buy although the price increases. We now know that price elasticity of demand can be used to find the incidence or burden of a per-unit tax is falling or to predict where it will fall if there is tax. There are different kind of tax charge is different country but there do have some similar benefit. As we should know, no one lives in isolation, tax benefit to everyone do not matter to the size of income. In Malaysia, more than 20 million car and citizen and benefit the travel on a public highway as some of the tax collected was use for road built, local road fund, maintained and more. Beside public used by citizen, New Mexico government provide education by using tax collected. Children in New Mexico benefit more than 47% which attend public school. The cause of government in New Mexico by giving such amount of tax on education is because it benefit the country in the future with more educated person. Besides that, student which attend college and university in New Mexico benefit 17% of the tax collected to help decreasing unemployment in the future by providing college graduates qualify for a job or even a better job. Children in Malaysia do have the same benefit on attend public school with free charge of education. Besides that, many people pay insurance or security for safety on their own as safety is very important to everyone. Therefore, citizen in New Mexico had an advantage by benefit another 7% of the tax collected provided fund police and other law-enforcement units. Some health support come from the text collected as the government in New Mexico gave 20% of the tax collected to help families through work of the Department of Health and human Service. Therefore, citizen have more than the benefit to build up a better future for the country as finally, 40% share of the gross receipts taxes collected by the state and distributed to local and country governments. Tax increase reduces the quantity trade and some of the gains from trade. While taxes increasing, price of buyer increase and the price to the seller falls cause the consumer surplus and producer surplus (profit) falls. Besides that, in the supply and demand theory, per unit tax does not matter much because buyer cares only the total price paid which is the amounts of supplier gets plus tax and the sellers cares more of the net to supplier which is price of buyer paid minus tax. Furthermore, tax reduce the quantity traded and some of the gains from trade. While the price of buyer rises causes the consumer surplus falls and the price of the seller falls causes the producer surplus (profit) falls. But then the losses captured in the form of the tax can be exchange were there no tax while the unit of those units is given by demand, and the marginal cost of the units is given by the supple. These lost gains from trade are known as a deadweight loss. Because of the tax interference in the market is the buyer’s values minus the seller’s costs of units that cannot be trade in economic. Loss to society we’re represents to show the important of deadweight loss. In the sense can be view as an opportunity cost of taxation, money collect from people to obtain a dollar tax revenue actually costs society more than a dollar. The costs of the raising tax revenues include the money raise, tax collectors and government agencies to administer tax collection and deadweight loss are the example of direct cost of collection which create the incentive effect of taxes and decrease the gain of trade. The concept of effective need to be discussed in the situation of what the tax is trying to accomplish in terms of government policy. For example, in the situation of non-alcoholic beverages, it can be expected that objectives of a discriminatory tax on this products would be to raise revenue or externalize perceived harm from consumption, or both. The term of discriminatory taxation, such as excise on non-alcoholic beverages, most of it in sweetened drinks has been subject of much debate in recent years. Taxes on such products have been imposed or expel, and in certain countries are being considered. As discriminatory taxation, an excise impose on sweetened soft drinks may raise tax revenues from this single category of products. It may also operate to change the consumptions of the product through the consequential growth in its price. Secondly, government impose three types of tax on tobacco. One of the types is excise tax. It is a good source of revenue and the dominant opinion is that people who smoke should be responsible for paying the costs that their use imposes on society. Human being need not tobacco for survival. The reason government levied excise tax on tobacco because it can raise the revenue for government and control smoker from buying cigarettes. Higher taxes are useful in reducing the use in tobacco among the youth and lower’s income groups. However, it has an extreme control on tobacco use. As evidence, governments have increasingly using a higher tobacco taxes as a means to discourage its use. A per unit tax often imposed taxes on a specific markets or goods. There are few types of taxes in economies. The most common per unit tax is excise tax which are usually imposed on those goods and services that seen to be have harmful associate. As the example above, tobacco and sugar-sweetened beverage are encourage to levy excise taxation. Furthermore, the price elasticity of demand measure a responsiveness of quantity demanded to change in price of the good. That means, when the prices are elastic, the more burden would goes to producer and also when the prices are inelastic, consumer will bear more of the burden. Moreover, there are few benefits such as citizen can enjoy education by using tax collected in Mexico. New Mexico government provide some collected tax to help families. Other than benefits there is also some drawbacks of per unit tax which are tax could reduce the quantity traded and there will be a deadweight loss occur. Lastly, the theory signified that the excise taxation structure will have an important consequences on government to accomplish multiple objectives. "Tax on Negative Externality." UKEssays.com. 11 2018. All Answers Ltd. 04 2019 <https://www.ukessays.com/essays/economics/tax-negative-externality-2192.php?vref=1>. "Tax on Negative Externality." All Answers Ltd. ukessays.com, November 2018. Web. 25 April 2019. <https://www.ukessays.com/essays/economics/tax-negative-externality-2192.php?vref=1>. UKEssays. November 2018. Tax on Negative Externality. [online]. Available from: https://www.ukessays.com/essays/economics/tax-negative-externality-2192.php?vref=1 [Accessed 25 April 2019]. UKEssays. Tax on Negative Externality [Internet]. November 2018. [Accessed 25 April 2019]; Available from: https://www.ukessays.com/essays/economics/tax-negative-externality-2192.php?vref=1.